I keep being asked to suggest good ideas for salads; ones that are simple, quick to make and don’t use hundreds of ingredients. Well this salad is so simple I’m almost embarrassed to blog about it. What’s not to love about this humble tomato, basil and mozzarella combo? It ticks all the boxes for me; its quick, goes with almost anything and is a real flavour explosion with freshly picked basil leaves, chopped chives and a sharp dressing made from rapeseed oil and balsamic vinegar. The one important thing to remember is that its only as good as the ingredients you use. Don’t skimp or think that out of season tomatoes will give the same depth of flavour. They won’t. 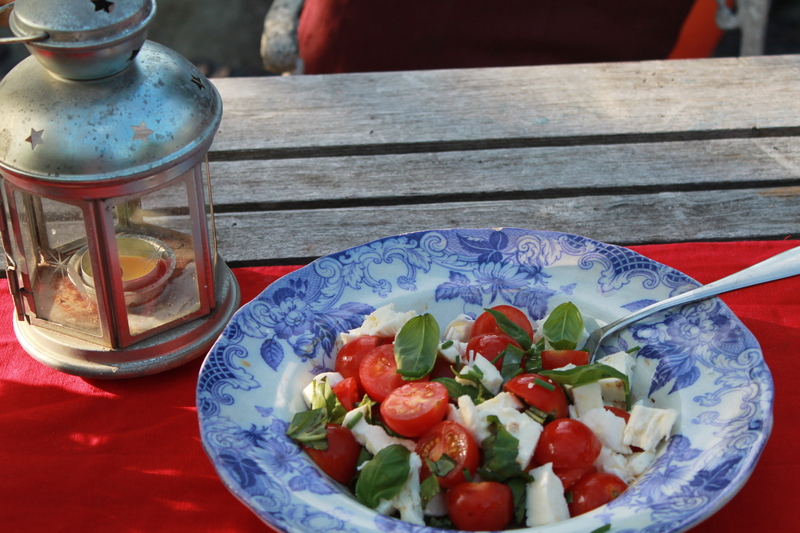 Use fresh British tomatoes, the first of the season, freshly picked basil leaves and good quality mozzarella. Combine with as good a quality balsamic vinegar as you can afford and the same with the rapeseed oil (I use Cotswold Gold). If you do use the best you can afford, it makes a world of difference lifting something as simple as tomatoes, basil and mozzarella to a different level. Eat on the patio, or in the garden in the sun while you can…Enjoy! Chop the tomatoes into a bowl, tear in the mozzarella and basil leaves. Make the dressing in a jar adding all the ingredients and shaking together. Pour over the salad. Finish with some snipped chives and there it is!! salad in 5 minutes. New here today! Although I live in Macau, China, I’m originally from Anglesey and it’s lovely to read so much lovely local stuff. I’m just dying to visit the new(ish) Furnace Farm food centre at Bodnant! I know I’ll spend a fortune there! Glad you are enjoying the blog…keep reading!